We’ll get a first look at the refreshed Audi R8 line-up at the New York International Auto Show next week. All of Audi's 2020 R8 supercars blow through the 200 mph barrier: a first. We expect the Decennium to make some headlines, marking the first time the R8 line nudges over the $200,000 before factoring in options. Spoiler alert: for that extra $19,000-and-some the limited-edition model doesn’t get a boost in power. 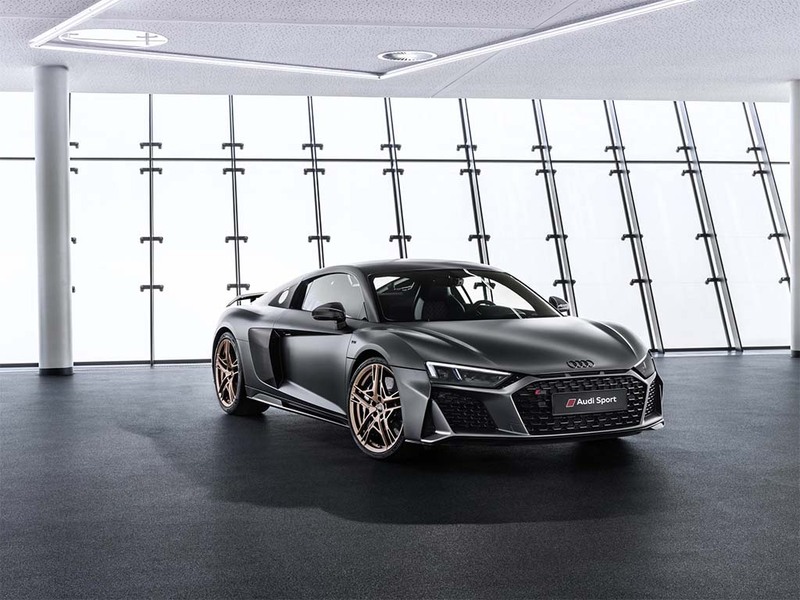 It shares the same V10 as the Performance edition, not that 602 horsepower and 406 pound-feet of torque will leave you wanting for much more. The added price tag accounts for distinctive metallic black paint, 20-inch bronze wheels, a bronze intake manifold, carbon fiber accents and a black aero kit. Add interior touches that include copper accent stitching and black-and-carbon-fiber detailing. All told, just 222 of the special edition models will be built, with a mere 50 coming to the States. And if the unique exterior and interior badges aren’t enough to ensure you don’t confuse your R8 with someone else’s, the puddle lamps project the special Decennium logo. As for the rest of the line-up, the “base” R8’s V10 is tuned to 562 hp and 406 lb-ft of torque and neatly nips 200 at the top end. That’s an impressive 30 more horsepower and eight pound-feet more than the 2019 models could deliver. 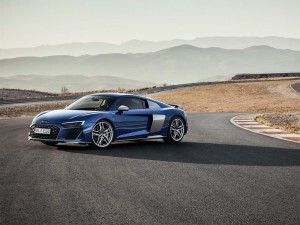 It starts at $171,150, while the 602 hp R8 V10 Performance model will now come in at $197,150 for 2020. The base R8 starts at $171,150, while the 602 hp R8 V10 Performance model will now come in at $197,150 for 2020. Power for the 2020 V10 Performance line is unchanged. However the 2020 coupe can now hit a top speed of 205 mph, the Spyder’s less smooth lines lowering the top end just slightly, to a still-impressive 204 mph. Across the board, the 2020 models undergo some modest styling tweaks, with slightly sharper edging up front, along with Audi’s new honeycomb grille and air inlets, and a front lip spoiler. Performance models feature titanium lower trim, with optional carbon fiber. Incidentally, for those who haven’t been counting, the debut of the Decennium marks the 10th anniversary of the Audi R8. 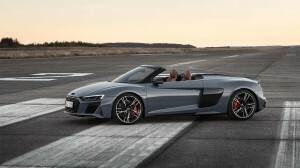 This entry was posted on Thursday, April 11th, 2019 at and is filed under Asia Pacific, Audi, Auto Shows, Automakers, Automobiles, Business, China, Coupes, Europe, Markets, NAFTA, New York, Product Reveals, Sales, Sales, South America, Super Cars, U.S./North America. You can follow any responses to this entry through the RSS 2.0 feed. You can leave a response, or trackback from your own site.